Introducing the Business Lite Package which provides a great value service for New or Existing Small Businesses. Not only does this Package contain Full Limited Company Set Up, Monthly Payroll and Guidance on how to complete your online Tax & VAT Return Submissions; we are also giving you access to our Business Growth System service which is worth £5,000. All this for a cost of only £25 a month! As your Accountants we will provide you with access and full training on our in house award nominated Online Accounting Software called ‘NOMISMA’. From the training provided you will be guided on how to process your Receipts & Reimburse Expenses to help you manage and calculate your accounting data in an efficient manner. In addition you will get full support and expertise from our Chartered Accountants on how to get the most out of the accounting software. If you find you rarely have time to access a computer then not to worry you can use our accounting software via a Mobile App keeping you in touch with how your business is doing whilst you are on the go! That’s just £300 + VAT p.a. for all of these quality services. 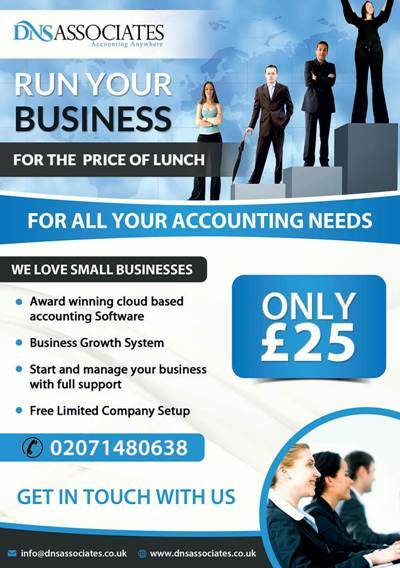 This is a great offer (representing a discount of more than 76%) which no small business can afford to miss. For year-end filing we review the work and charge accordingly. Annual Return filing for just £20 + VAT.